Home All Flashing Tools Android FRP Solutions Crack Software Downloads Flashing Tools FRP Tool Samsung FRP Tool New FRP/Google Account Bypass and Flash Tool For Samsung, Xiaomi, HTC, SPD, Qualcomm and MediaTek Etc. 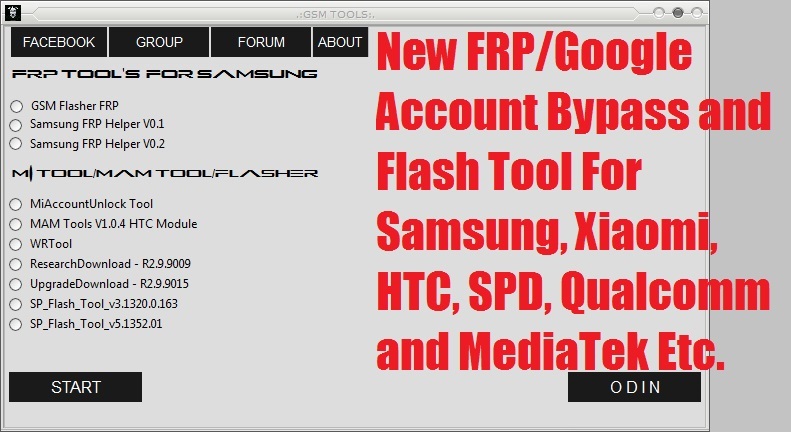 New FRP/Google Account Bypass and Flash Tool For Samsung, Xiaomi, HTC, SPD, Qualcomm and MediaTek Etc. Hi friends, today you will get another Factory Reset Protection bypass tool or so called Google Account remove or bypass tool for all most all Android versions and this supports Samsung, Xiaomi Redmi, HTC, Spreadtrum, Qualcomm and MediaTek, so download and enjoy the new FRP/Google account bypass tool and unlock all recent Android smartphones without any paid tool. This tool works on all most all Samsung, Mi, HTC Android phones and it also supports other devices having Spreadtrum, Qualcomm and MediaTek chipset Android phones. Tool Type: FRP Bypass or Google Account Remove Tool. How to Use This FRP/Google Account Bypass GSM TOOL? Now click on Start button and connect the phone with Fastboot Mode or ADB Mode. After Unlock Success Remove the phone and Switch it ON. You can use all the above options or function on the same tool in the GSM TOOL, and it's free to use for every one, so download the new FRP bypass tool and use to unlock and flash any Android smartphones.